O.I. Foundation Regional Conference in Los Angeles will be on Saturday, February 7th. 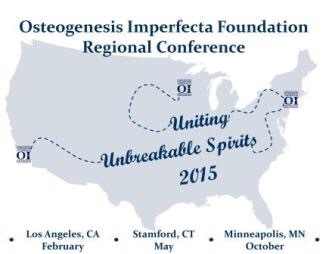 The OIF or Osteogenesis Imperfecta Foundation, will be holding three regional conferences in 2015. The Foundation holds a national conference every two years, with the next one slated for 2016, so this will be a fantastic opportunity for OI’ers to get together on a regional level. There are plenty of folks on the West Coast that were not able to make the trip to this year’s national conference, so holding a one day conference in Los Angeles is a great opportunity to learn from, share with, and meet fellow OI’ers and their families. There will be plenty of informational sessions throughout the day – specifics will be announced closer to the event. I’m excited to announce that I will be a panelist at the ‘Physical Therapy and Exercise’ session! I look forward to sharing my thoughts and experiences with everyone in regards to fitness, nutrition, exercise, as well as the mental and emotional aspects that are involved. Please post below if you will be attending!